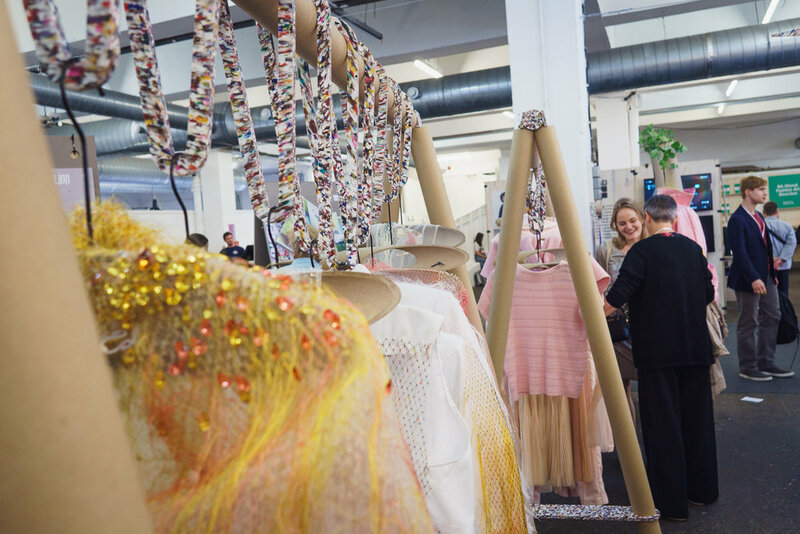 At Graduate Fashion Week, many universities design and create stands to showcase the portfolios and collections of their hard working students to the 30,000 guests that come through the doors of the Truman Brewery! Each year, we recognise the most inventive and artistic design, taking into account limitations such as financial resources, the visitors experience and the management of the stand itself, including the maintenance by staff and students alike. This year, we welcomed judges Rob Armour, Creative Presentation Director at Ralph Lauren, Julianne Lavery, VM Consultant & Training Manager at WSUK and Sophie Quilling, Global Visual Merchandiser at Aquazzura to select the stand that expressed the a story, met and exceeded the criteria and captured their imagination. 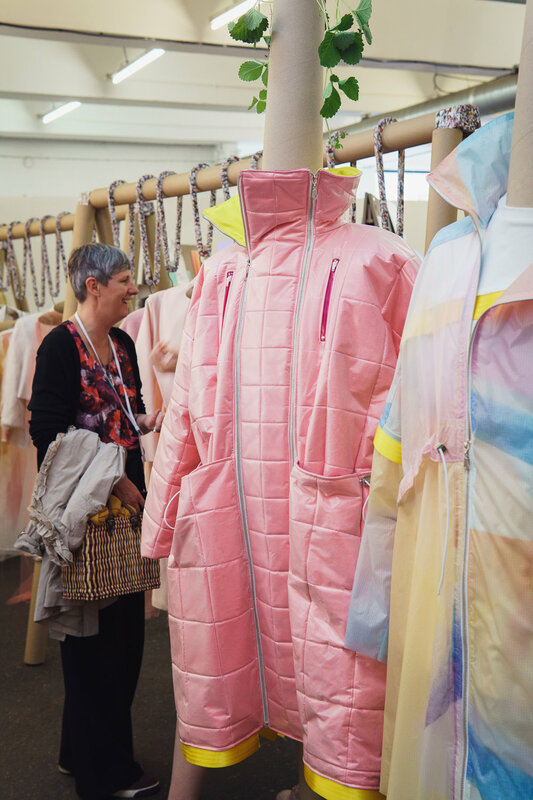 At the Best of GFW18 show, Edinburgh College of Art were announced as the winner of the Stand Award for 2018! To find out more about the concepts behind the exhibition, we caught up with the stand designer Anaïs Moisy, and Mal Burkinshaw, Senior Lecturer and Programme Director at ECA - find out what inspired the winning design below! How did you begin the approach the creation of the stand? What were the conceptual beginnings of the design? 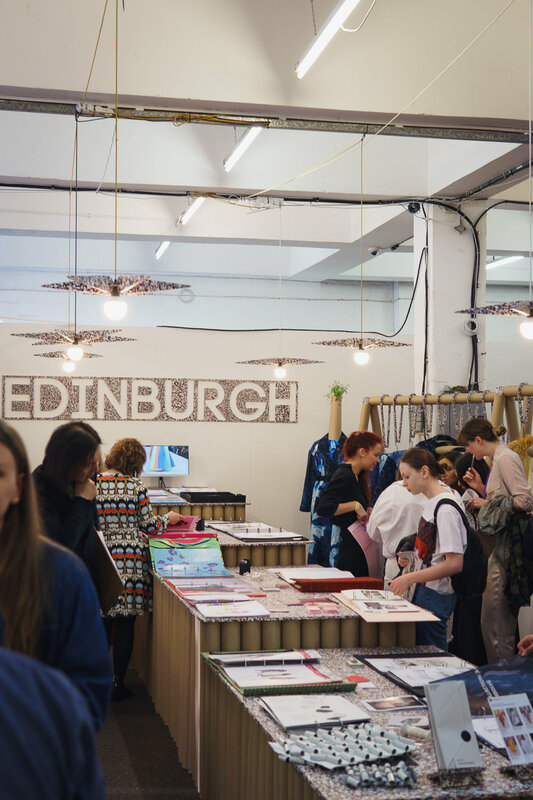 Anaïs Moisy: The team in Edinburgh asked me to design a sustainable stand, with a fresh and boutique feel and a modular format, to be reused for future years. The challenge was to use sustainable materials as much as possible, while achieving a clean and professional feel. Moreover I wanted to be considerate towards the origin of the materials, on how the stand was designed, prototyped, manufactured and reused. On this thought, my wish for the future of design would be that sustainability is not part of any brief or concept. It should be embedded in each project, like 'user friendly' is nowadays! Finally, it was essential that the stand would be accessible, user friendly, and have the work of every students showcased equally. 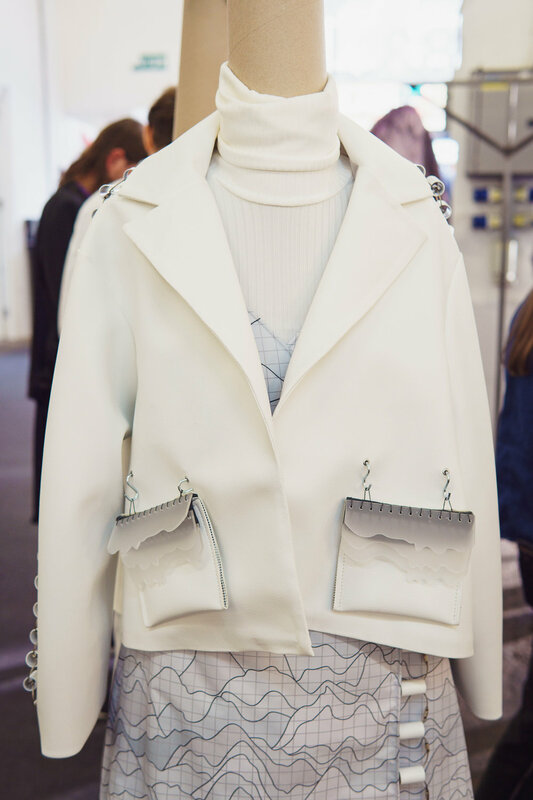 Anaïs Moisy: The first source of inspiration was the fashion studio in ECA. I had to understand the way the students, technicians and tutors were working, which materials they were using, what are their needs? I was interested in the waste produced in the studio. At first, I wanted to use the large amount of calico the students were using and wasting. I realised that the fabric was roll up around paper tubes and few of them were a lying around the studio. Inspired by Shigeru Ban’s work and some inspirational pictures given by the teaching team, I decided to use them as primarily material for the stand: it is a strong, recycled, recyclable material. I had to go through several iterations of prototyping to design an elegant solution which was safe, modular and suitable for the space. Looking for an unconventional material to bring colours, originality and a boutique feel I came across a design workshop in Glasgow caked ’Still Life’ making small A4 plastic sheets made from recycled plastic. Even though they were too small for the design I produced, it was the type of product I was seeking to get the visual balance between the brown cardboard and the vibrant colours of the plastic. Moreover it would give a novel touch to the stand while keeping the idea of using sustainable materials. TELL US MORE ABOUT THE PROCESS OF BRINGING THE STAND TOGETHER. Anaïs Moisy: I went through an iterative design process for this project, presenting and receiving feedback from the teaching team and the students at different stages of the project. Each cycle included a series of design options, samples, and prototypes, refined each time to improve the security/stability of the rails, the layout of the space. After the final design was approved, I started to manufacture the different component of the stand, for example, to make the coat hangers I have cut paper tubes using a jig on a table saw in the university workshop then sanded and assembled by hand. The tubes to make the tables are assembled 3 by 3 with screws and then with paper clips on site, making it simple to assemble, dismantle and reuse in another configuration. The tubes for the rails are assembled on site with L shapes MDF corner, making them very stable, safe and free from glue. The design was though through to limit the amount of waste & lost raw material to a minimum, for example, the left over of the tubes used to create the hangers have been used to make the ‘heads’ of the mannequins and the lamps are designed using the centre of the petals. The paper tubes are manufactured in UK and I ordered the plastic sheets from a London based company called 'smile plastic’, converting waste plastics into colourful, aesthetics, 100% recycled , 100% recyclable boards. Congratulations to Edinburgh College of Art for their award winning design, admirable and progressive ethos and for thinking ahead - as the stand will be donated to local charities, repurposed for next year!